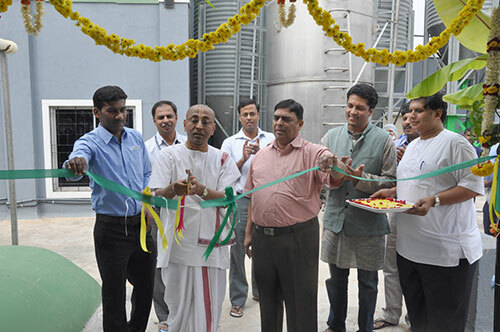 On 29th November, Akshaya Patra inaugurated a solar plant at the Vasanthapura kitchen, Bangalore. The solar plant which was sponsored by Stichting HoogeWoert and supported by Liesbeth Van Geest and Rutger Zonneveld, was inducted by Chanchalapathi Dasa, Vice Chairman of the Akshaya Patra Foundation alongside R Madan, COO of Akshaya Patra. With the capacity to generate up to 70 units of power a day, the plant will run till 4 a.m. on just the power provided through the solar panels. The plant will be used power all the applications that use single phase power in the kitchen, like fans, computers and other systems. The device works through the use of solar panels which are made of photovoltaic (PV) cells, which transform sunlight into direct current electricity through the day. Speaking on the occasion Chanchalapathi Dasa says, "The very important thing in Akshaya Patra is how to prepare the meal in the most cost-effective way. And with every possible opportunity to reduce the cost, like for instance this one, if we can save that much of electricity with the solar energy, which is also very environmentally clean, we must do that. And that is how Akshaya Patra has to operate, and we are happy that we have a donor, who is supporting us." This initiative will help reduce the kitchen's dependency on grid electricity, and provide protection from power failures and fluctuations. One of the biggest advantages of the solar plant however, is that it is an environment-friendly, renewable source of energy - a factor very important to The Akshaya Patra Foundation. The solar plant with basic yearly maintenance has the capacity to provide clean, reliable and green energy for decades.